UPDATE: The Jupiter pick-up/drop-off location has been changed to the Harriet L. Wilkes Honors College (MC-01) in front of the visitor loop. The shuttle route may be subject to change as we continue to receive feedback from the university community. Parking and Transportation Services is pleased to announce the addition of an intercampus shuttle service that will begin on Monday, March 13th, 2017. 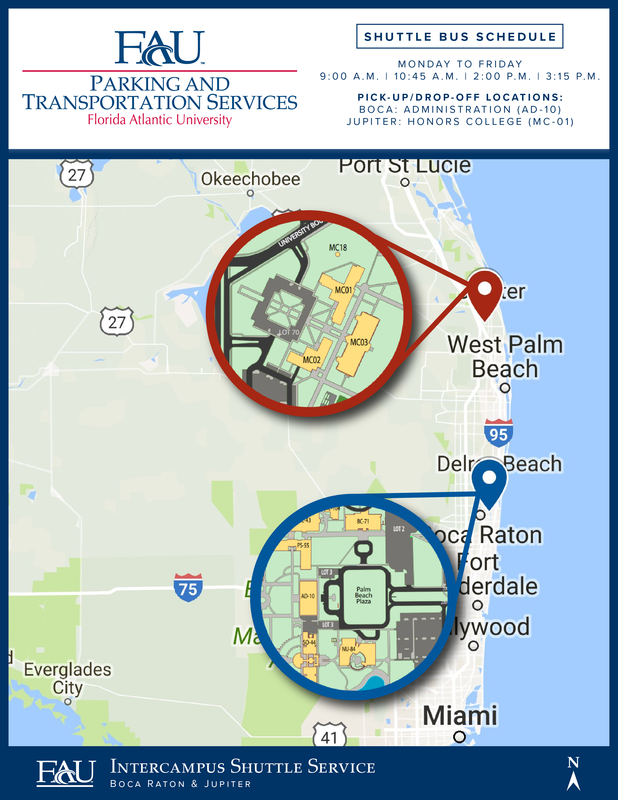 The intercampus shuttle service is FREE for all students, faculty, and staff and will operate Monday through Friday from the Boca Raton Campus to the Jupiter Campus of Florida Atlantic University. For more info, visit: www.fau.edu/parking/services.php.